Guns are an effective deterrent against bad guys with guns. 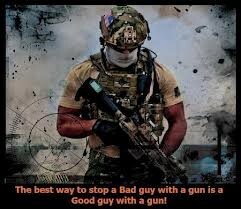 As you cannot prevent bad guys from getting guns, the only way to stop them is by being better armed. Draws on the MAD (Mutually Assured Destruction) principle and that, on a personal level, guns do appear to be an effective deterrent against crimes committed by strangers. There are plenty of more effective methods of stopping bad guys with guns than having a population armed to the teeth and a system that ensures that bad guys can arm themselves with ease. The best way to stop a bad guy with a gun is to make sure he (or she) never gets a gun in the first place. We can work towards this goal through a variety of societal mechanisms. Broad measures such as improving anti-poverty programs, expanding mental health care, and strengthening educational programs may help prevent citizens from becoming “bad guys.” More specific measures such as more stringent regulations on gun sellers, universal background checks, licensing, ammo controls, and assault weapon bans all make it harder for the “bad guys.” If these policies are unable to prevent a “bad guy” from arming himself, then an effective police response is necessary to limit the damage. Assuming all else fails, and a “bad guy” is able to circumvent all of these safeguards, an armed citizenry is still woefully inept at preventing mass shootings. A Mother Jones study of 62 mass shootings in the past three decades reveals that there was maybe one case of an armed citizen stopping a mass murder (and even this case is a stretch). However, many gun advocates protest, this study only includes shootings where four or more people were killed (the FBI definition of a mass shooting) and leaves out all the cases that could have potentially turned into mass shootings had an armed civilian not intervened. The reason we don’t see civilians stopping mass shootings is because these heroic citizens are so quick to react that they prevent the shootings from reaching that category. Therefore, the multitude of cases where armed citizens “prevent” mass shootings are overlooked. Such data also overlooks the deterrence an armed population has on potential mass shooters, which I will term the MAD theory of guns. Just like nuclear deterrence, bad guys are less likely to attack an armed citizen (or an area with many armed citizens) out of fear of deadly reprisal. This line of argument is suspect on many levels. First and foremost, it is impossible to prove or disprove a counterfactual. To use a charged historical example, I could assert that had the Confederacy proven victorious at Gettysburg, they would have won the Civil War. This is a rather reasonable historical hypothesis. However, no matter how much evidence I accumulate to support such a conjecture, there is no way to prove or disprove my statement because it didn’t happen. The South didn’t win at Gettysburg, and there is only one suspect case of an armed citizen stopping a mass shooting. How many mass-shooting-could’ve-beens were prevented by armed citizens is statistically unknowable. Even if we accept the counterfactual as a legitimate line of argument, it still fails. Why are armed citizens so effective at preventing shootings from killing four or more people, but utterly fail to stop shootings after they reach that threshold? Mass shootings tend to happen quickly. In a crowded space, the first four fatalities can easily occur in the first few moments before even the best trained “good guy” has time to react. There is no logical justification that “good guys” would be stunningly effective at stopping shootings before the four person mark and yet be completely incompetent after that mark. We have already debunked the notion that mass shootings predominately occur in gun-free zones. In the few cases that armed citizens have attempted to stop mass shootings, they accidently targeted the wrong person, were trained professionals (off duty police officers or soldiers), or were swiftly gunned down. None of this evidence supports the contention that a heavily armed population is effective at preventing mass shootings, but rather supports an effective police force as a last line of defense. It is also worth noting that none of the current gun safety proposals would disarm any of these “good guys with guns.” They would, however, ensure that these “good guys” are actually good guys (not mentally ill or criminals) and have the necessary training to act in a responsible manner (training a bit more extensive than the eight hours it typically takes to get a concealed carry license, or potentially four hours if you live in Texas). Also note that not one of these “good guys with guns” were packing assault weapons, and yet many of the mass shooters used such guns to deadly effect. The final line of defense gun advocates posit is the MAD theory of guns. However, there is no empirical evidence to support this theory. As we explained in a previous post, the majority of mass shooters commit suicide or engage in suicide by cop, meaning that the presence of armed citizens or officers is not a deterrence. Mass shooters do not predominately target gun-free zones, meaning the lack of guns does not appear to play much if any role in their choice of target. The theory also overlooks how infrequent mass shootings are and how rarely guns are used in self-defense. The majority of shootings occur when a “good guy with a gun” wouldn’t even enter the equation. Most gun homicides stem from arguments, not felonies. While tragic, mass shootings account for less than one percent of gun murder victims. For every time a gun in the home injures or kills in self-defense, four are used in unintentional shootings, seven in criminal assaults or homicides, and eleven in attempted or completed suicides. As one study points out, “an estimated 41 percent of gun-related homicides and 94 percent of gun-related suicides would not occur if no guns were present.” The rise in fatalities that would necessarily accompany a further arming of our society would far outweigh the potential benefits of preventing more mass shootings (and this is assuming that a heavily armed populace deters mass shooters, which it doesn’t). Even if we accept the counterfactual and that armed citizens prevent mass shootings at the rate gun advocates contend without the deleterious side effects (all of which is unequivocally not the case), MAD theory still fails. Imagine for a moment an America that matches the NRA’s wildest dreams. All gun regulations have been stripped away. Every man and woman is armed. There is not a single public place without a “good guy with a gun.” Is this really a society that we would want to live in? A society where we are constantly on high alert, seeing the most innocent of gestures as possibly threatening and questioning every stranger’s intentions. This vision is not one of security, but one of constant fear. Even the most hardened gun advocate should be reticent to suggest that this vision is a worthy goal. One only has to look at societies that have moved further down this path to see the utter failure of MAD theory. A society relying on armed deterrence for security is a failed society.